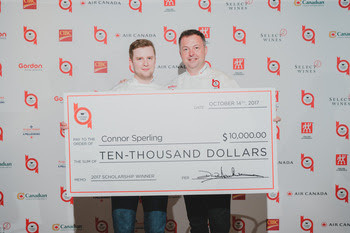 VANCOUVER, BC (October 16, 2016): The Hawksworth Young Chef Scholarship Foundation is thrilled to announce Connor Sperling (26) of Vancouver’s Boulevard Kitchen & Oyster Bar as this year’s winner following the exciting National Finals held this past Saturday in Toronto. The winner earned the title, “2017 Top Young Chef of Canada,” a $10,000 grand prize, an ultimate cookware set from Zwilling J.A. Henckels, a prepaid $500 CIBC gift card, as well as an unparalleled opportunity to stage at a globally renowned restaurant. Regional Heats took place earlier this year in Toronto, Montreal, Vancouver and Calgary where the competition narrowed down 40 contestants to just eight finalists, who competed alongside Sperling at Toronto’s George Brown College. While the panel of revered judges and culinary experts recognizes each contestant for their talent, ultimately, only one is named the Scholarship’s winner. Using common pantry ingredients provided by Gordon Food Service and Club House for Chefs, as well as a selection of mandatory ‘Black Box’ ingredients which are revealed just minutes prior to the competition’s start time, Sperling presented his winning main dish; Wild Mushroom Crusted Lamb & Lobster Emulsion with Roasted Rutabaga, Braised Kohlrabi and Farro Risotto and for dessert; Vanilla Buttermilk Grapefruit Parfait, Banana and Maple Crème Légère with Salted Almonds and Raspberry Coulis. Not only did his plates impress the eyes and palette of the judges, he was also graded for his strong demonstration of professionalism and kitchen etiquette. The winner’s announcement took place at the evening reception, held at Oliver & Bonacini Catering’s beautiful Aperture Room, which was followed by a night of celebration over delicious canapés and wine provided by Select Wines. As an honourable mention, Andrew Lecky (27) of Cambridge’s Langdon Hall and Soloman Mason (24) of Penticton’s Joy Road Cateringplaced in second and third, respectively, taking home $5000 and $3000 prizes. In its fifth year, the Hawksworth Young Chef Scholarship continues to provide a platform for talented young chefs to get a head start in their career through their annual culinary competition, as well as ongoing recognition, mentorship and incredible opportunities to work in the country’s leading restaurants. Scholarship founder, Chef David Hawksworth thanks this year’s National Finals’ judging panel: Mark McEwan, McEwan Group; Anthony Walsh, Oliver & Bonacini Restaurants; Chris Stewart, Donnelly Group; Jackie Kai Ellis; Jacob Richler, Canada’s 100 Best; Lee Cooper, L’Abattoir; Marc-André Royal, Le St-Urbain; Riley Bennett, George Brown College; Sarah Musgrave; Scott Jaegar, The Pear Tree Restaurant; and host Lien Yeung of CBC for joining him in in his vision to inspire and challenge these young Canadian chefs to be at their best. Furthermore, the Scholarship would not be possible without the valued sponsorship from Air Canada, Gordon Food Service, CIBC, Zwilling J.A. Henckels, San Pellegrino, Select Wines, Canadian Linen, Club House for Chefs, Brewery & the Beast, Ecolab and FreshPoint to which Chef Hawksworth extends his most sincere thanks. Beginning winter 2017, applications for the 2018 competition will be open to Canadian chefs aged 28 and under. Please visit www.hawksworthscholarship.com.